Spring is here in Oz. Naturally, this means beers, barbeques, salads and sausages. The latter of which were laying around in my fridge waiting to be eaten midweek. I love sausages. Hot. Meaty. Gluten Free (of course!). Barbecued with onions and a little barbeque sauce in some (now gluten free) bread. Don't forget that gluten free beer, short shorts, sunscreen and a backyard of men barricking for different ports teams too! Yes. I love my barbeques. This recipe, funnily enough, isn't to do with barbeques (oops!) but it IS to do with sausages...because what do you do when you've got a dozen in your fridge and don't feel like a hot dog (because your man isn't really a fan of 'snags' and is slightly allergic to onion?) plus youe don't have any potatos to make bangers and mash? Well.... you get a little more creative,a little spicy and make Capsicum & Sausage Gluten Free Pasta with Ricotta and my gosh this was delicious. Better yet - the man lapped it up! Boil a large pot of water and cook the gluten free pasta according to the instructions. Drain with hot water. Meanwhile, cook the sausages until just done and remove from frypan and slice thickly. Heat a tablespoon olive oil in the warm frypan and add the onion and cook until soft. Add the mushrooms and capsicum and saute lightly. Add the gluten free pasta sauce and stir until warmed through. Add the olives and chilli and sausage. Stir and add the cooked gluten free pasta. Heat on a low heat until hot. Spoon into bowls and top with some fresh ricotta cheese and pepper. Weeknight dinners should be a simple affair . In my opinion, whether you've been at work all day, had a day off, or have been running around after your kids, the last thing you want is to make something complicated for dinner. 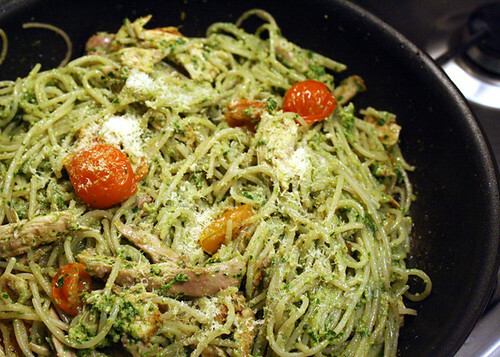 Enter - the simple pesto pasta . We make this at least once a week in our house. Mixing it up either vegetarian steamed broccoli and peas with toasted pine nuts or add some chicken for extra protein - it really is simple pasta! Cook pasta in a large pot of boiling water. Drain under hot water when cooked, al dente. Add to hot pan with pesto, tomatoes and chicken. 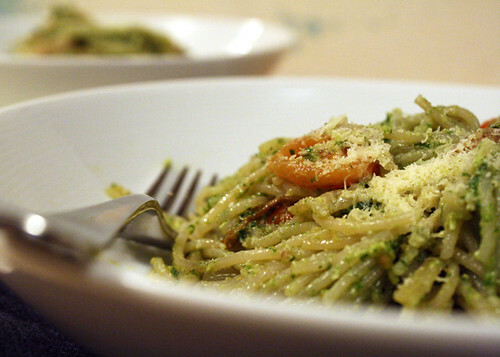 Reduce heat and toss to coat pasta with pesto, until warm. Stir through parmesan. Warm serving bowls in low oven for a few minutes. Serve hot with parmesan and a little cracked pepper. Sometimes, when the weather is a little chilly as it has been these last few weeks in Perth, you just want something warm, something comforting, something that will make enough for two nights so that the next night, when you can't be bothered cooking you can simply serve and reheat. I love leftovers and this certainly does the job on a cold wednesday night! I also love to cook a bit more than what we'll eat so that I can take it for lunch the next day. This means that I don't have to go looking for something Gluten Free and saves me a lot of money that could be spent elsewhere - like back into your mortgage, a savings account, or just blow it on a new pair or shoes, which reminds me, my black minnie mouse heels just died so it looks like that is where those lunch dollars will be going. This is also great for cooking the night before and simply reheating for approximately an hour before the family gets home, or make it and then reheat to take to your Dad's place, as I am doing tonight. It looks like I'm late - sorry Dad! - so I better run. Oh and make sure if you're taking this over to Dad's place that he provides dessert; Gluten Free - Of Course! Cook pasta till aldente, drain in cold water to stop cooking and set aside. In a large frying pan heat oil and cook onion till soft , add mushrooms and cook for a couple of minutes. Add the mince and separate with a wooden spoon. Stir continuously until the meat is browned. Add tomato paste, parsley and tinned tomatoes, stir and allow to gently simmer for 20minutes. Taste and add pepper or maybe some mixed herbs to taste. Meanwhile, cook and cut the corn, wash and grate the carrot (I don't bother peeling them as this preserves all the skin of vegetables usually contain most of the goodness! )and grate some cheese. Add the corn and carrot to the mince, stir to combine and repeat with the pasta. Transfer to a large baking dish, or if you made this in a large stovetop to oven dish (like Le Creuset) you can simple cover the top of the pasta with a few handfulls of cheese. Pour the cream over the top and transfer to the oven. At 180Deg C this took about 25minutes. *You can use a bottle of Gluten Free tomato pasta sauce instead. This recipe easily feeds 4-6people and the veggies can be interchanged. Tonight I had no corn so I used a grated zucchini instead, etc, etc.